Thread by @absurdistwords: "Let's do operational definitions. What do you think complaining is? A complaint is literally defined as "a statement that a situation is una […]"
Let's do operational definitions. What do you think complaining is? A complaint is literally defined as "a statement that a situation is unacceptable"
Complaining is nothing more than naming that something is wrong. A complaint is the first step in fixing a problem. People like to denigrate complaint by equating it with "verbalizing unnecessary and frivolous dissatisfaction rather than taking action to resolve a real problem. And those most likely to criticize complaint are those who find themselves at the end of one. As a very, very well-prepared survivor of a terror attack, there are a few things you can do to prepare for a terror attack or mass shooting but literally all of those things simply overlap with advanced first aid and nothing more. There is no special skill to surviving mass violence and terror. Nothing you can prepare for. It is random. You will get hurt or you will not. It’s how you respond to injuries that matters. The only possible training you can get that might help is combat training. Which I also argue isn’t suitable because the American/Western school of martial armed training is entirely based around superior firepower and battlefield control, which is why we keep losing wars. We know that you can get kicked out of a pub for wearing a T-shirt with the old-fashioned definition: "Woman: adult human female". Billboards with the same words get instantly removed for the offence of transphobia. So.... what is a woman in transspeak? Let's listen. 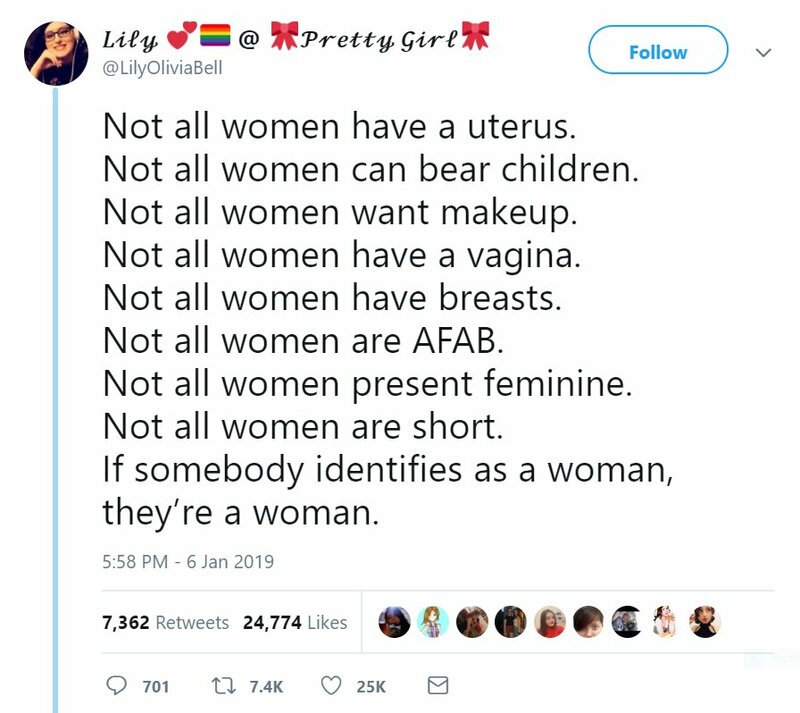 1/ "A woman is whatever she defines herself as"
2/ "If somebody identifies as a woman, they’re a woman."